Ltd., a member of the Keppel group of companies in Singapore. Western provides other services to domestic petroleum operators. Company has become the largest underwater contracting firm on the East Coast." Columbia University with an en- gineering degree. He has devel- oped proprietary techniques for ultrasonic testing of concrete un- der water, and has worked as a project engineer and diver on nu- merous underwater sewer and gas pipeline projects, cathodic protec- tion installations, and pier re- habilitation projects. Operations" (ASSOPO '80) is scheduled to be held in Trond- heim, Norway, June 16-18, 1980. It will present the state of the art and potential future develop- ments of automation as a tool for improving safety in shipping and offshore petroleum operations. About 75 papers from 10 coun- tries will be presented during the three-day meeting. Reliability; Man-Machine Sys- tems ; Simulators for Training; and Maintenance Systems. This symposium is a successor of five previously held Symposia on Automation of Maritime Op- erations. About 400 experts from nations active within this field are expected to attend. Norway, Poland, and the USA. Registration deadline is March 15, 1980. Registrations are ac- cepted, with an increased fee, until May 1980. At today's high fuel costs these savings can be up to $1,000,000 per vessel,** making SCAMP® hull cleanings an essential part of your profit program. The following chart illustrates typical fuel savings of a 50 MDWT vessel operating at a reduced speed of 11 knots as an example. Increase of shaft horsepower and fuel consumption becSme necessary to hold speed at 11 knots due to loss of hull and propulsion plant efficiency as time elapses Since regrowth of foul- ing takes place after each cleaning, maximum net savings are realized from a regular SCAMP hull cleaning program. In the preceeding example, net savings (fuel savings less SCAMP hull cleaning costs) were $127,000. Optimum cleaning programs are, every round trip for long-haul VLCC's and every four months for smaller vessels commencing at the onset of fouling, about 10 to 12 months after dry dock. A SCAMP hull cleaning program returns fuel savings many times greater than the cost of the cleanings even when operating at reduced speeds. SCAMP units. Many ship operators bank on it. A hmned number oI copies of mis Exxo-. Systems inc . P O Bon 9 Deer LL. 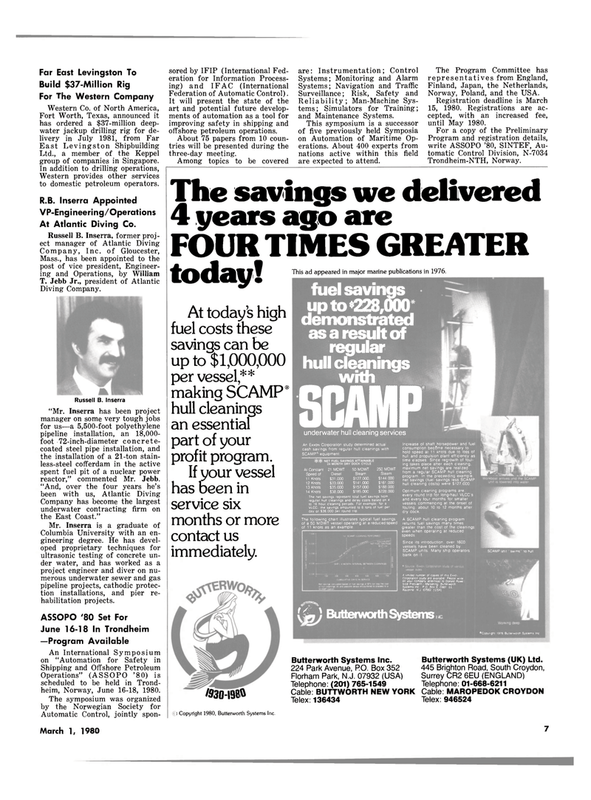 Telex: 136434 Telex: 946524 ) Copyright 1980, Butterworth Systems Inc.